This weekend Keith and I headed up to Dallas to see his family. It was a quick little get a way and a fast paced but fun weekend. We got to see many of our friends who live in Dallas, celebrate all the summer birthdays with Keith’s [huge] family and still have time to take Bella by a local dog park. It was quite a busy weekend but we had a lot of fun. But with that said, we were both happy to return home and enjoy a little R&R before today got started with a vengeance. Once we got home from Dallas and unpacked everything we both were more than ready for some dinner. I was not in the mood to come up anything that took more than even an ounce of effort and we really didn’t have much to work with thanks to our travel plans this weekend. 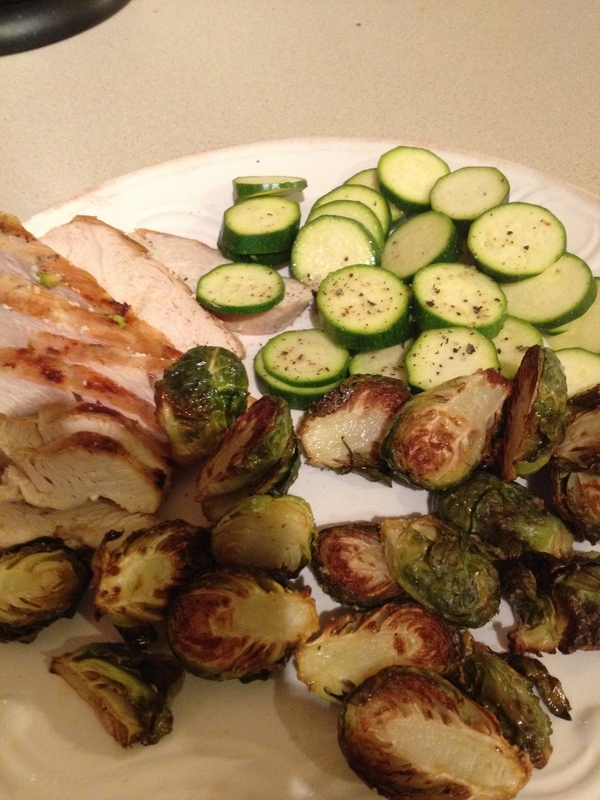 So I was forced to scrounge around and come up with this: chicken, roasted brussels sprouts and zucchini. It hit the spot! This morning I was up and at ’em for a 5:30am Body Combat class. Next coffee was in order. Like obviously. (Keith and I went to Hawaii last December and we are still rationing out the Kona coffee). I took Bella on her 45 minute walk and am now eating breakfast typing this gem of a post. Heh. Let’s get this party Monday started. Chicken and roasted veggies is my number one go-to meal when I’m not feeling the creativity. We actually had it yesterday! Great go-to meal!! I went to Omaha yesterday for a bridal show…and definitely would have been better off not wasting my time. I was super disappointed! Oh well, you live and learn! Oh my gosh love that class!!! Hawaiian coffee is so good! Definitely one of my favorite parts of our trip there! Sounds like a great weekend–that dinner looks like a winner in my book! Ha! 5:30 was literally the only time I had time today. It was brutal!! As for honeymoons….MAUI!! It is amazing. Ka’anapali Beach is where we stayed and it was absolutely the most amazing time! 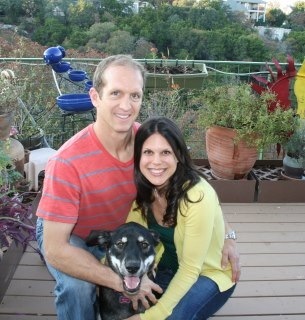 Lovely looking couple you and Keith! !